Reading has always been a love of mine. I can't remember not ever being surrounded by books. I feel very at peace in libraries and book stores. I love the smell and the atmosphere. This year I plan to be more proactive in tackling my reading list. I have realize that I have neglected educating myself through reading. I thought I could rely solely on information on the internet but I find that I focus better with a real book. There are several 'professional development ' books on my shelf ready to go. I have also started using the Goodreads app. It's fun to browse the lists and find new treasures. I have set a goal of 25 books this year and I'm looking forward to finding some new books to love. I have selected a yearly word for the past five years and feel like it's a helpful thing to participate in. I was introduced to the concept by Ali Edwards and she has a class every year. I took the class last year and highly recommend it. In the past selecting a word was easy, almost like the words found me. This year not so much. When the first week of 2016 came and went with no word jumping out at me, I decided to not stress and give myself until the end of January. 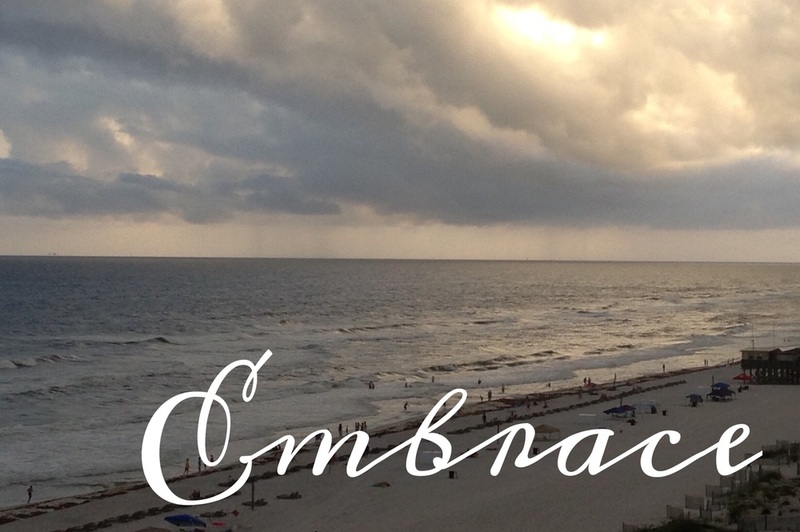 I've decided on the word 'embrace'. There are several areas of my life I want to see improvement in and I like the idea of embracing those areas. I want to embrace time with God, embrace time with my family and embrace creativity. I will share more on my journey with this word as the year goes on! I have very little of my scrappy work posted online so I've decided that I will start putting some older projects here on the blog. Today I've picked a two page layout from 2009. Since we have just survived a snow/ice event this week, I thought this 'snow day' spread was appropriate! All the products on the layout are from KI Memories. Today I added some buttons to my right sidebar. These buttons will connect you to my Instagram, Twitter and Pinterest accounts. Please hop over and follow me! I'm looking forward to connecting with you! I get bored easily. And I don't like clutter. So our home is sparsely decorated. Our mantle in our family room gets the most attention and I love changing it out for the seasons and holidays. At Christmas our house is the most decked out so by the time January comes around I'm ready for a lean slate. Decorations are minimal with a nod toward winter. White, silver and blue are the things I look for. Below is our mantle and an arrangement on our breakfast table. Today marks the beginning of this blog and my relationship with the world. I am excited to meet you and to see where this path will take me. My plan is very loose at this point but my tagline gives you an idea of my current thoughts. "Faith, Family, Life, Creating" pretty much sums up what I think the content of this blog will be. My relationship with God and my family are my top priorities. Life cannot be ignored! Its funny, chaotic and worth recording! Creating makes me happy! Paper, paint, photography, decorating and organizing are just a few things I dabble in.